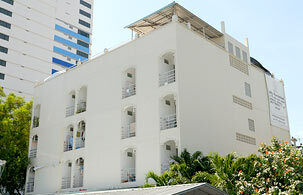 Ekkamon Mansion is a new and modern apartment located in the center of Phuket Town. The apartment is conveniently minutes from downtown, dining and shopping plaza. Provide you with 2 different room types; Fan room and Air-condition rooms. All come with standard amenities and facilities. This safe, secure, private & clean accommodations are offered either on daily or monthly basis.